There is something mournful in a movie that is made sincerely and then falls flat due to its lofty ambitions. Sometime in 1992, Harry (Shahid Kapoor) or Harinder is awaiting a life-changing letter in his remote Punjab village. Apart from idling with his village friends, borrowing cars to race with trains, and having an empty purse, Harry falls for the 'new Kashmiri girl in the village' Aayat (Sonam Kapoor) at first sight. Soon, his bicycle chain starts slipping off near the girl's abode. Hand-written notes are exchanged quietly, dipped in water as evidence disposal, and finally, caught in a downpour, the girl promises to tell him,"Tomorrow." Only, the girl has left the village in haste with her family, as Harry hauntingly looks at a disappearing train. These initial parts of the movie are all charm and simplicity. In rising exasperation of the story's disregard for time lines and redundancies, Harry misses a marriage-possible meeting because he is summoned for the Kargil war. He doesn't inform Aayat for dramatic effect rather than logic. Thus is the period until INTERMISSION survived. Part two. Harry calls up Aayat, but the forced turn of circumstances, wouldn't let the lovers communicate. Aayat is a travel freak now, moving from Scotland to Punjab to Ahmedabad to Scotland and back again to Ahmedabad with a sore face. The air force objected bombing scene is a sitting duck, like the hand video games of the nineties. By the time Harry's left arm is paralysed, I have to leave the theatre. I never thought I would walk out of a cinema theatre midway, ever. It is easier if you are at Westend. Of course, you don't get a movie as flawed each time. Only a bad movie made with confidence and a bloated budget, nowadays; a gem, sometimes. 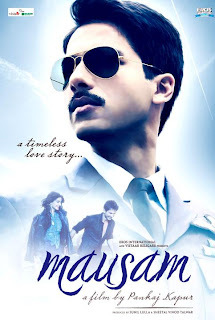 Mausam is slayed by a debutant director's ambition, that the story had to cover so many geographical settings and event references. That every historical event from 1992 to present had to adversely affect the lovers' lives is just too sad to be true. That James Cameron kept it spectacularly simple in Titanic (1997) - A ship, two lovers and an iceberg. Also the absence, of any hint of fire and passion between Shahid and Sonam only adds to the misery. If all the venom is well-deserved, Pankaj Kapur (An amazing actor, no doubt, Director? Ahhh?) does have the promise of telling a good, simple tale. He shows his stuff, especially in the village scenes. We say, try again. Something simpler please. Pritam's music and Irshad Kamil's lyrics are a saving grace, an odd contrast to the cracked proceedings. Some arresting moments when the Hans Raj Hans rendered Ik tu hi tu hi tu hits the screen. I was ready to tolerate through the cliché love story just to catch Mirage 2000 in action. It seems the makers screwed up even with that factor too.